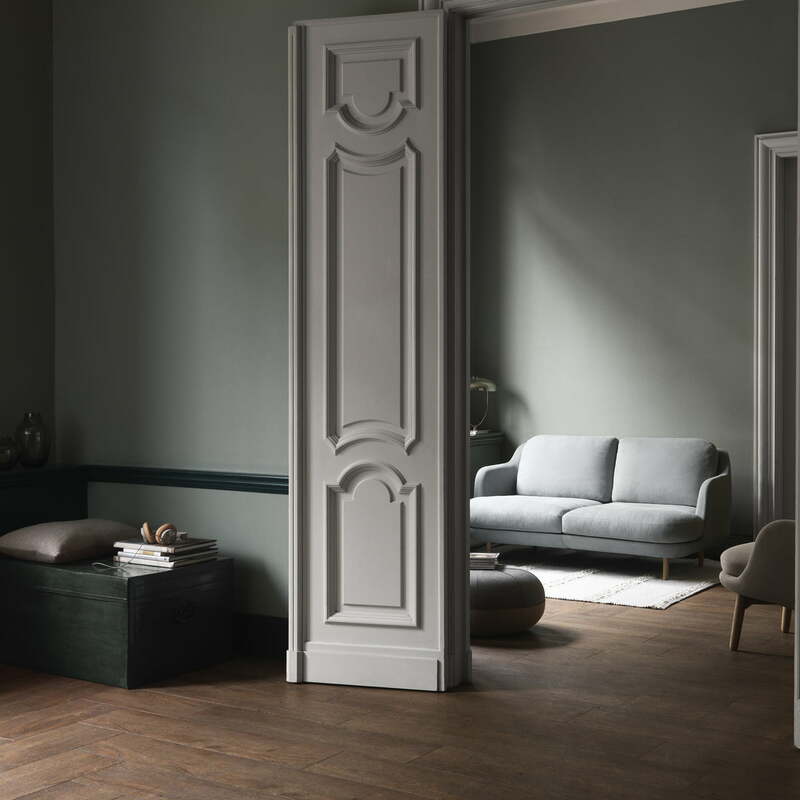 The Lune sofa by Fritz Hansen is a creation by the Spanish designer Jaime Hayon that combines Nordic minimalism with southern elegance. The curvy, almost sculptural appearance of the sofa can be perfectly introduced into various décor styles and stylishly enhances any living room. 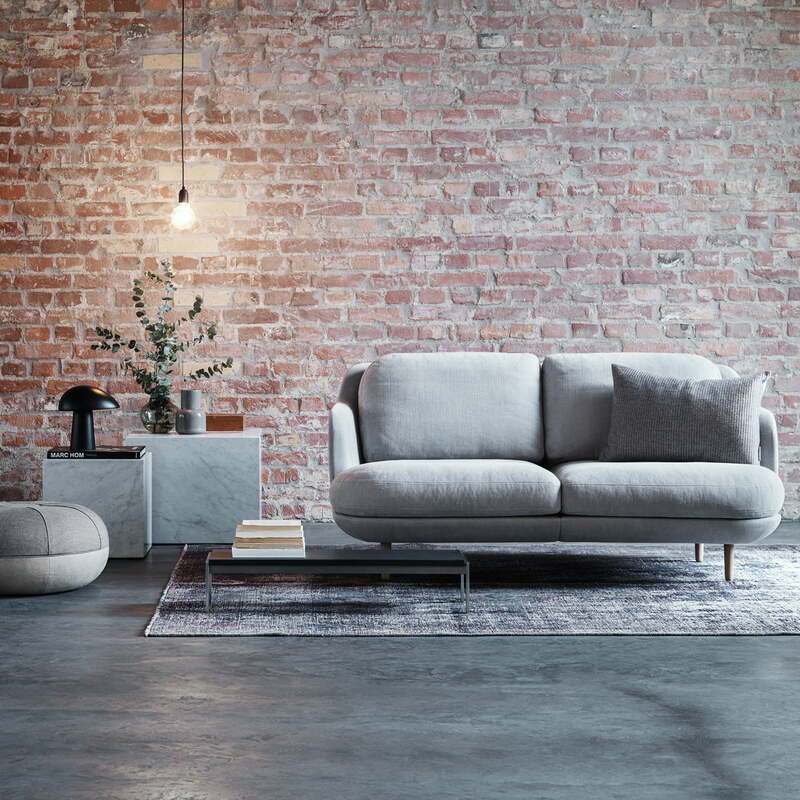 It is also not without reason that the sofa was called Lune: In Danish, this is the word used to describe the feeling when everything is just right. With this in mind, the designer aspired to fulfil this goal in regards to aesthetics, functionality and quality of the sofa. 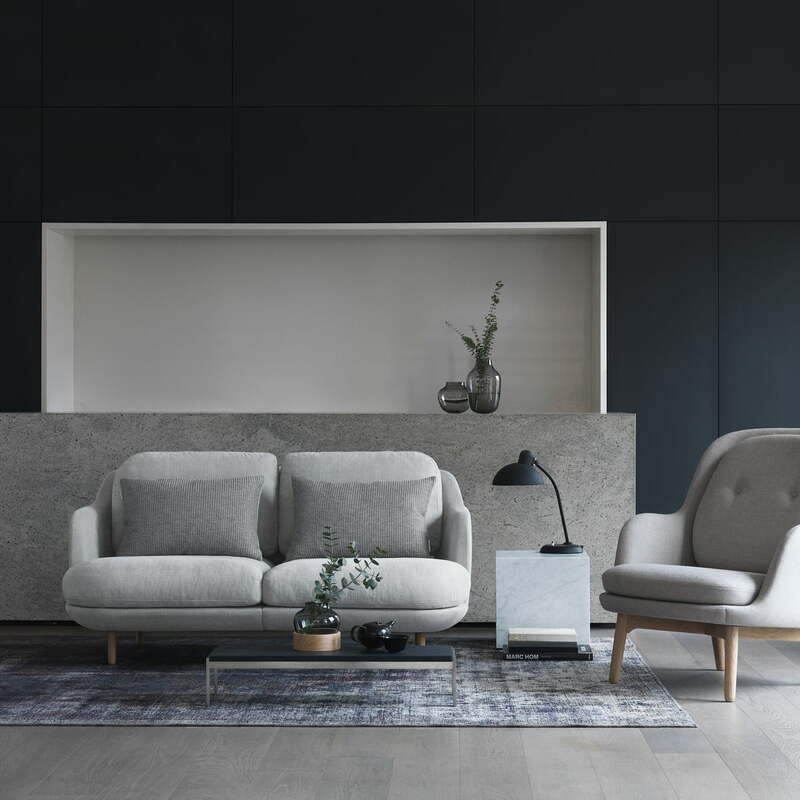 The modular system offers numerous design possibilities that allow the sofa to be integrated into any room structure - from the 2-seater sofa to the L-shape futniture and the chaise longue options. Depending on individual taste, a seat can be designed that optimally adapts to different needs and offers maximum comfort. The back is designed in such a way that it does not look out of place when in the middle of a room, and harmonises wonderfully with the front. Supported by thin feet, the sofa appears lights and unobtrusive despite its voluminous curves. Lune has an exceptionally soft padding and a wide seat that is covered with a mixture of cotton and linen. It is complemented by comfortable cushions that make up the backrest and nestle wonderfully around the body. Perfect to spend hours snuggled up on the sofa. 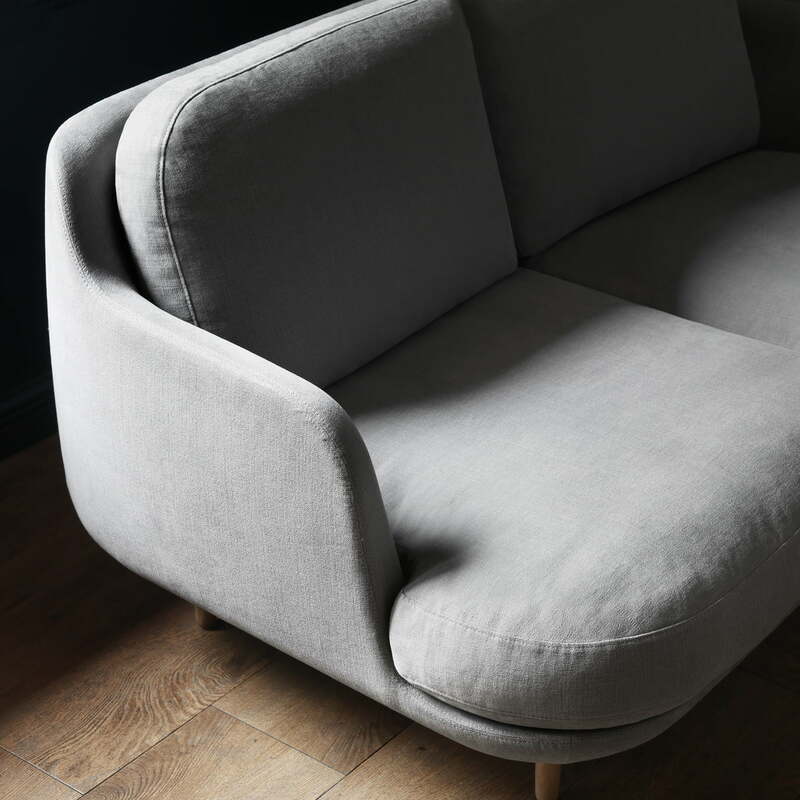 Upon demand, the Lune sofa is available in various other sizes, materials and colours. Isolated product image of the Fritz Hansen - Lune 2 Seater Sofa, oak / grey. The sofa combines Scandinavian minismalism with southern elegance - a combination that ensures a real eye-catcher in any environment. 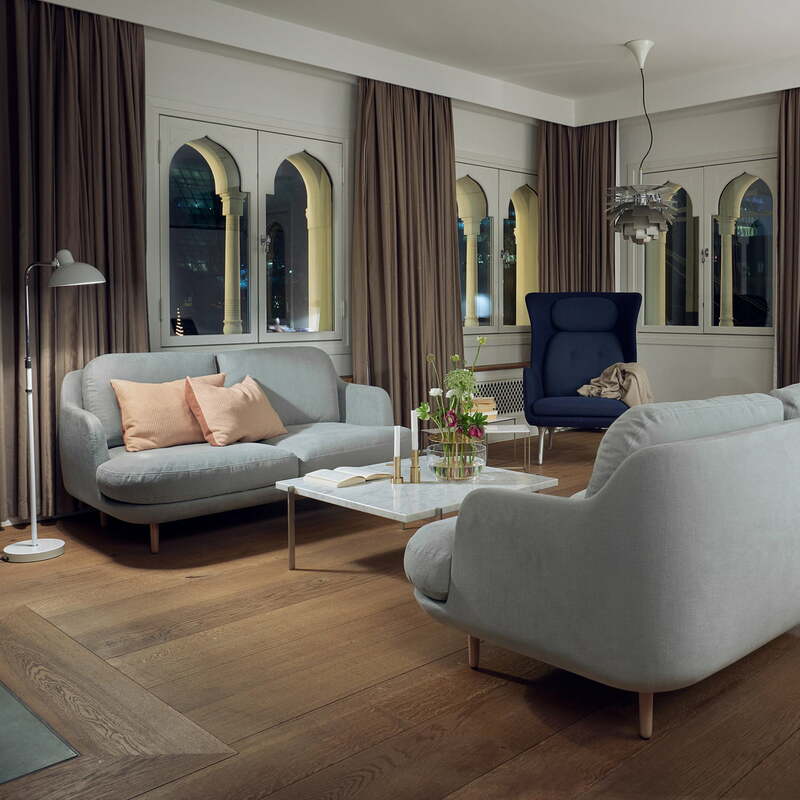 Lifestyle product image of the Fritz Hansen - Lune Sofa 2 seater with the Celine Manz pouf. A touch of colour can be introduced to the sofa with various accessories. Lifestyle product image of the Fritz Hansen - Lune Sofa 2 seater. Thanks to its minimalist appearance, the sofa is easily combined with other pieces of furniture. 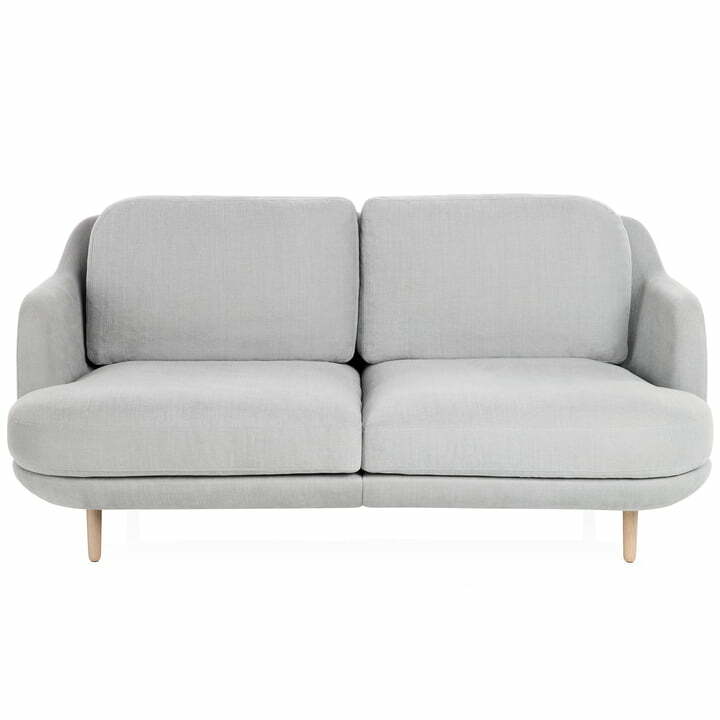 Detailed product image of the Fritz Hansen - Lune Sofa - 2 seater - grey. The minimalist design of the sofa is achieved with soft curves and thin legs. 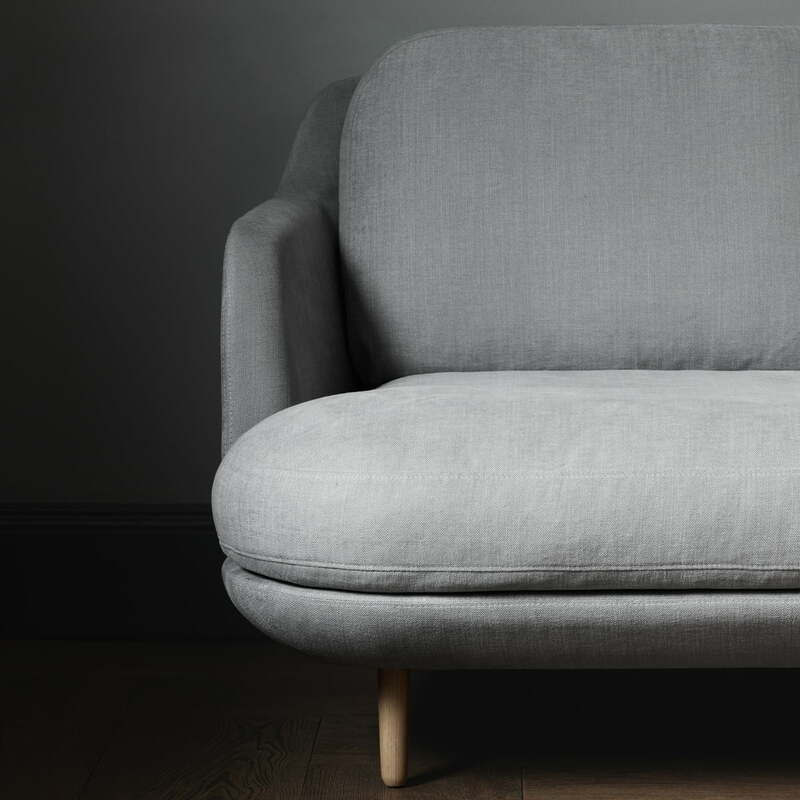 Detailed product image of the Fritz Hansen - Lune Sofa - 2 seater - grey. The backrest and soft padding guarantee extraordinary comfort when hours are spent relaxing on the sofa. Detailed product image of the Fritz Hansen - Lune Sofa - 2 seater - grey. 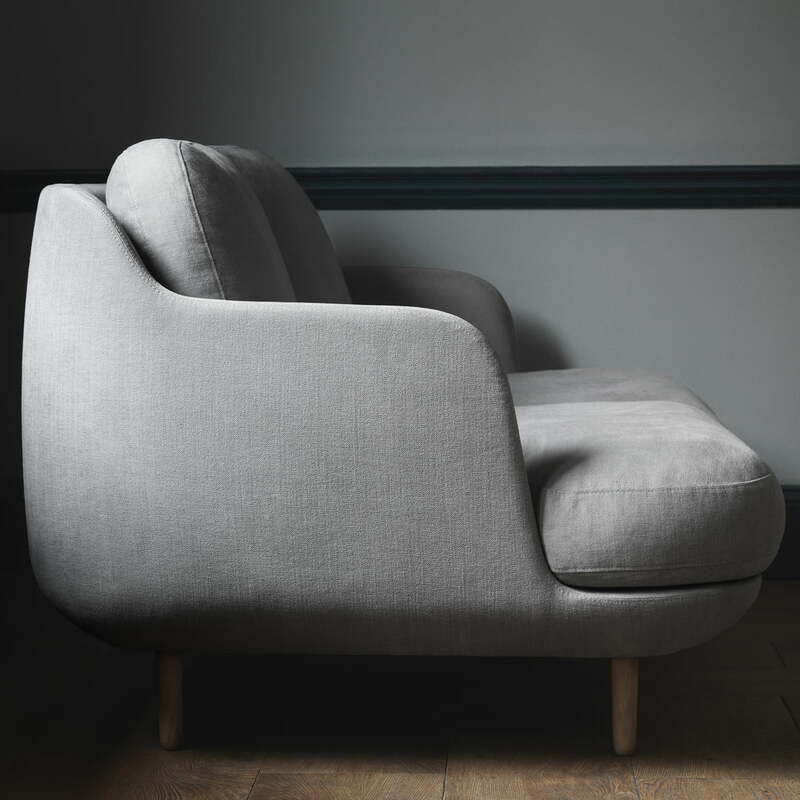 Lune has an exceptionally soft padding and a wide seat that is covered with a mixture of cotton and linen. Side product image of the Fritz Hansen - Lune Sofa - 2 seater - grey. The curvy, almost sculptural appearance of the sofa can be perfectly introduced into various décor styles and stylishly enhances any living room. 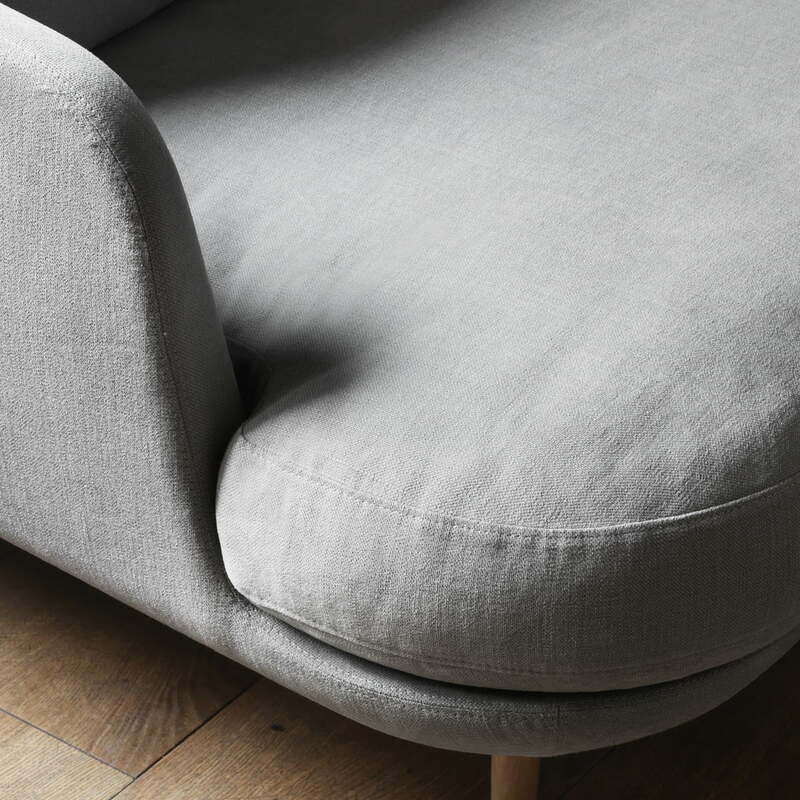 Detailed product image of the Fritz Hansen - Lune Sofa - 2 seater - grey. The back is designed in such a way that it does not look out of place when in the middle of a room, and harmonises wonderfully with the front. Lifestyle product image of the Fritz Hansen - Lune Sofa 2 seater. The sofa can be seamlessly introduced into an already existing seating area and combined with other furniture. 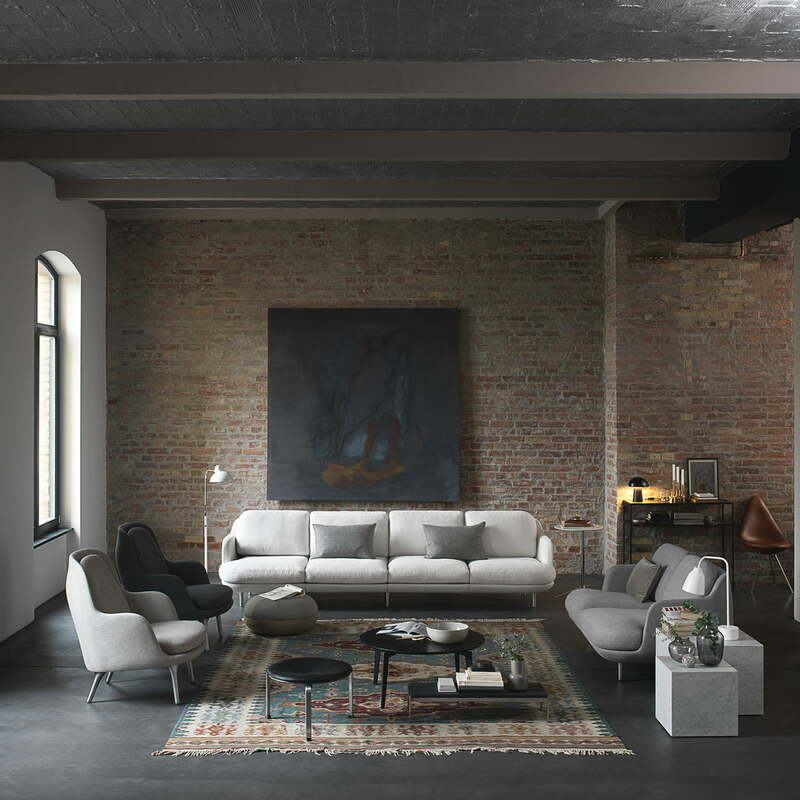 Lifestyle product image of the Fritz Hansen - Lune Sofa 2 seater. 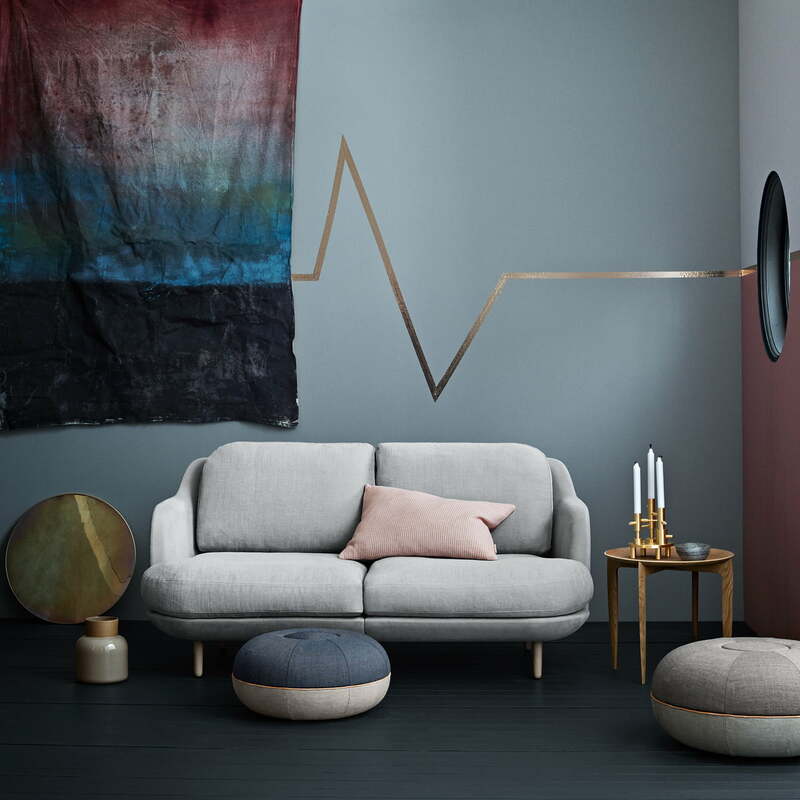 The Lune sofa by Fritz Hansen is a design by the Spanish designer Jaime Hayon that combines Nordic minimalism with southern elegance. 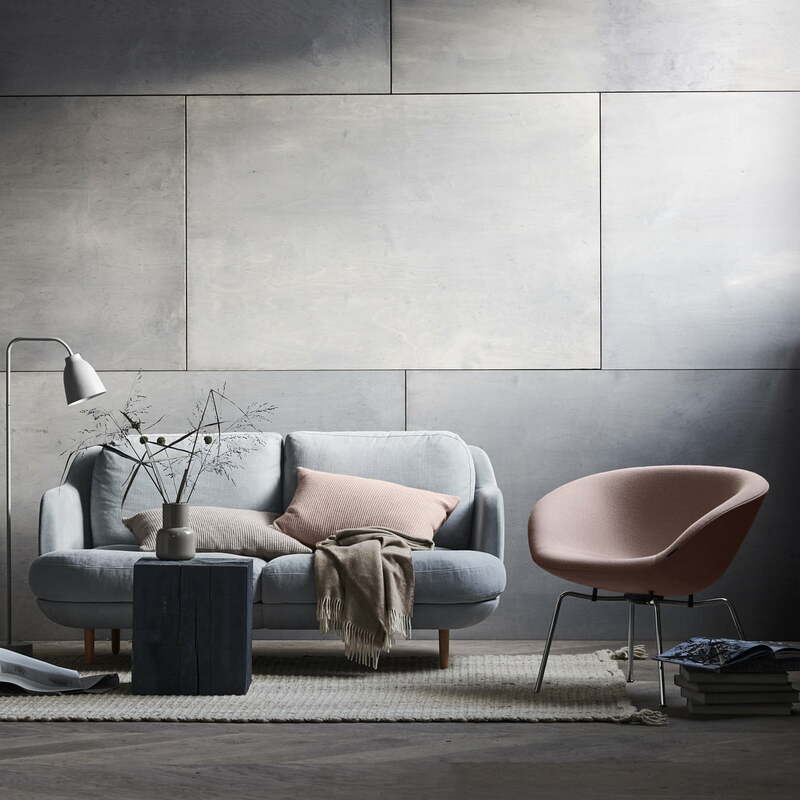 Lifestyle product image of the Fritz Hansen - Lune Sofa 2 seater in the colour grey. Thanks to its unobtrusive shape, several Lune sofas can arranged in a room.